"Betty, you've no idea what a fascinating little critter a chicken can be." --as Bob MacDonald in THE EGG AND I (1947). "I'm beat to the socks!" --as George Cooper in FATHER WAS A FULLBACK (1949). MacMurray explaining to son Tommy Kirk what an understanding father he is in THE SHAGGY DOG (a 3.2MB .MOV file courtesy The Walt Disney Company). Bad boys: the actors of film noir by Karen Burroughs Hannsberry (Jefferson, N.C.: Farland, 2003). 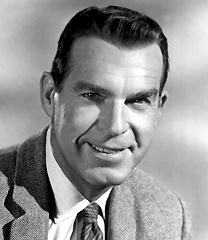 TVNow's monthly Fred MacMurray schedule -when his films will be on TV.